“Electric Bike” above boasts a dynamo which stores energy while traveling downhill and releases it to provide power for climbing up grades. 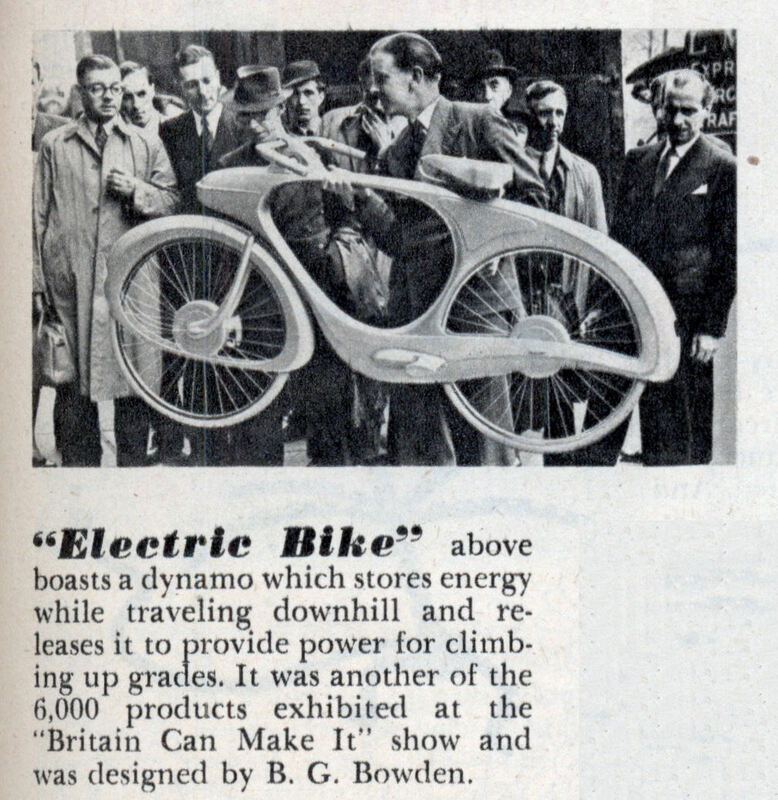 It was another of the 6,000 products exhibited at the “Britain Can Make It” show and was designed by B. G. Bowden. I think this would sell today if it worked well. It’s like a two-wheel Prius. I think it looks pretty neat too. Those old Bowden Spacelanders are quite collectible these days. 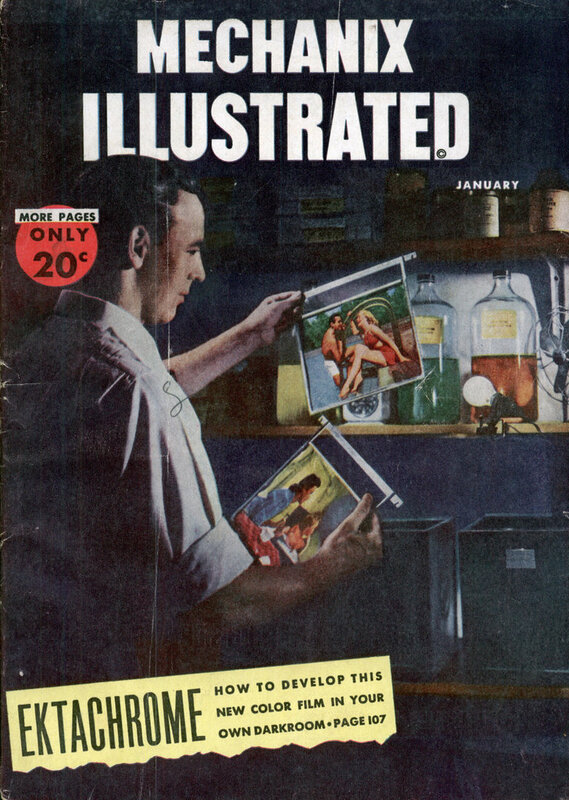 Thanks for this great archive piece – I posted about it on my blog today. Really love the picture of the guy holding the bike. Is it for real or a Photoshop picture? I really enjoy your insights and features on this site and I would like to visit your blog regularly. I am like minded on these issues. We need to get away from fossil fuels. I would buy one of these in a heart beat and for 60 years old the lines are better than many of the bikes produced today. I love it…..did it really work and can we make one now? I don’t know if this model really worked or not, but they do make these today. They cost about $2000 dollars, and they’re geared primarily toward customers in third world countries. The technology they used is called regenerative braking and has been around for a while. Regenerative braking kind of reverses your motors wiring into an alternator like the one charging your car. (which uses a couple horses to run and charge your battery) Regenerative braking is more effective on trucks, trains or passenger cars – bicycles do not generate enough momentum to make a big difference. I have been commuting on a BionX electric bike motor kit installed on a Trek Commuter bicycle. The BionX system uses this regenerative technology but does not mean that you never have to plug in again, it will extend your range per charge by about 10-15% maximum. That is not that much but its for free and actually saves you on brake pads. I think at this time the BionX is the only electric motor for bicycles that has that feature. I got my Electric motor kit at NYCewheels in NYC, I highly recommend this shop if you are looking into riding the future. Couldn’t one also ostensibly use some sort of mechanical energy storage, such as a spring? You break downhill by contracting the spring, and gently and gradually release the spring when you want some extra drive to get back uphill.